Noche Buena is one of the few important events where all the members of my family is required to be present. I remember when I was young, my mom would encourage my sisters and I to take a nap every December 24 so we can stay up the whole night for Noche Buena. Looking back, I didn’t really understand why it was so important for our parents that we stay up with them and welcome Christmas day. Fast-forward to today and I see myself as excited and as eager as my parents were. Now that I have a family of my own, I still uphold this simple tradition. Noche Buena really is the perfect time to show our loved ones how much we truly care and appreciate them by catching up and learning more about each other over a spread of sumptuous dishes. Year after year I am very thankful that I get to spend Noche Buena with my family & I cannot imagine myself celebrating it any other way. Christmas resonates with me even more, now that I’m a mother to two beautiful children. I’m sure all mothers share the joy of welcoming Christmas as much as we love celebrating it with our loved ones. I could only imagine the families who don’t get to celebrate Noche Buena together. For the dad who prepares food onboard a ship , for the mom who sees her child off to work in the wee hours of the night,and for the husband who has to work thousands of miles away from home. For years, Noche Buena is always incomplete for the De Velez, the Delfin and the Valtiendas families. But this year, they got to spend Noche Buena even before Christmas Eve came. These families together with other family & friends prepared a delicious feast. With the help of Lady’s Choice, they set up an advance Noche Buena where each family’s favorite food were served and their houses decorated with trimmings, to make the spirit of Christmas complete. I was emotional watching the video. The De Velez, the Delfin and the Valtiendas families are just three of the many families who don’t get to celebrate Noche Buena with their loved ones. I could only imagine the sacrifice they had to go through every Noche Buena. Thankfully, Lady’s Choice understands that togetherness is one of the real moments of love that one can do for his/her family. Thus, they helped these families pull off a surprise for their loved ones to celebrate an advance Noche Buena for them to enjoy. Truly, these three stories testify to the value of family. Our families are the people in our lives that make the season special. They are the ones that love us deeply and would definitely wish to spend time with us this Christmas. 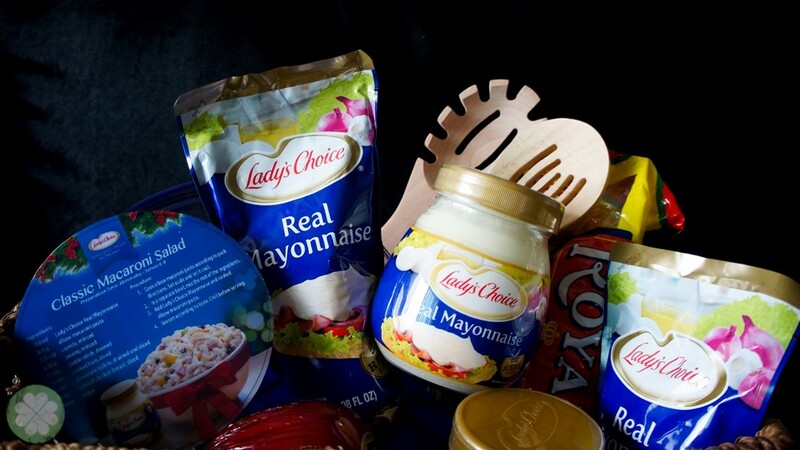 Lady’s Choice have given me so much memories, dating back from the time when I was just a kid, it’s the first snack I’ve ever prepared for myself- toasting two loaves of bread, generously spread with Lady’s Choice mayonnaise. And during Noche Buena, I get that nostalgic feeling as rekindle and remember my mom preparing a classic macaroni salad or a potato salad for our family. Thank you Lady’s Choice for our Noche Buena package!